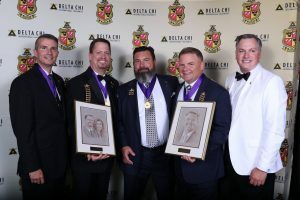 Brother Patrick Alderdice, Ball State ’92, Brother Rod Arnold, Texas A&M ’88 and Brother David Cloutier, Embry Riddle ’92 were announced as New Founder level donors at Delta Chi’s 61st International Convention in Denver, Colorado on August 4, 2018! Gentlemen, thank you for your commitment to the longevity and success of Delta Chi! We are so grateful for your steadfast contributions of your time, your talent and your treasure! To all our Brothers; anytime you see these men of character, please make sure to thank them for all they do! Stay tuned for some more information about these men along with stories about all our New Founders! It marks a significant achievement in our lifelong endeavor when a Brother or Friend of the Delta Chi Fraternity makes a lifelong commitment to supporting the leaders of tomorrow through the Fraternity and the Foundation. It is with our sincerest gratitude that we acknowledge these driven members of our family by publishing their names in the following lists. Their enduring commitment to a lifetime of giving allows for a brighter future. Thank you for your continued support of Delta Chi. An asterisk (*) represents deceased. Upon reaching the milestone of NEW FOUNDER, three (3) identical charcoal portraits will be commissioned. One portrait is presented to the donor’s family, one given to the donor’s chapter, and the final portrait is displayed in the International Headquarters in Iowa City. Additionally, donors who reach this giving level will also receive a key-shaped lapel pin that can be worn at any time and a New Founder’s Medallion, to be worn at International Conventions and other formal affairs. The medallion is the same as the international officers (“AA”, “CC” or “DD”) and Order of the White Carnation, except a purple ribbon is used to dictate the New Founder level of giving.